They are everywhere. I mean I used to live in the ancient capital of Ayutthaya, Thailand for nearly a year. The temple ruins were literally my neighbors. What’s the point of all this I’m babbling about? Well, the main purpose of my visit to Yogyakarta, affectionately nicknamed Jogja (pronounced “Jok-jah”), was to see some temples. 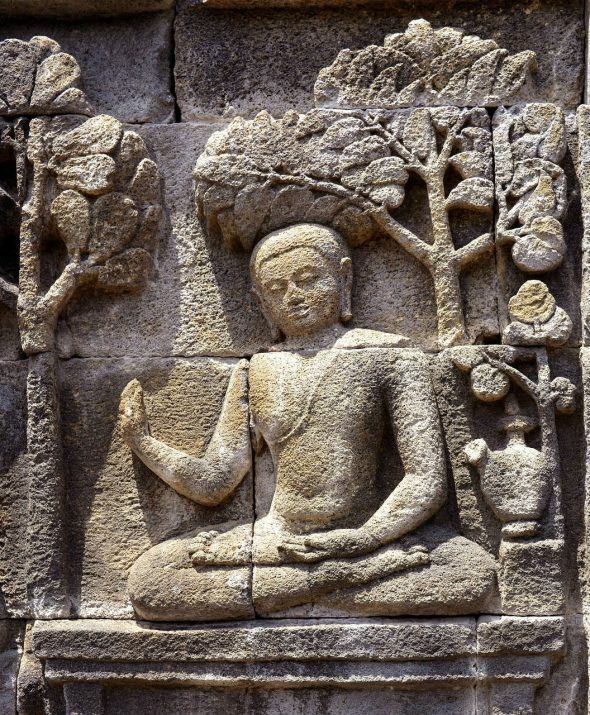 But not just any temple, a majestic Hindu temple complex, and the largest Buddhist temple in the world. Yep, totally worth adding a few more temples to my list of temples that I have seen! Now, while I’m totally annoyed at the astronomical price they charged to see these temples, at the end of the day, the experience was interesting, humbling, beautiful, and yeah, pretty darn worth it. 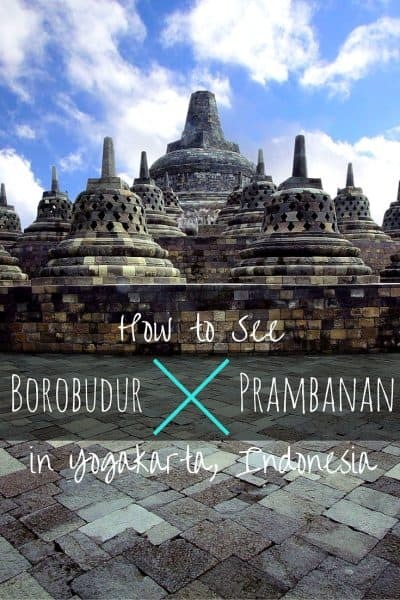 Here’s how to see Borobudur and Prambanan along with my experience! We negotiated a deal with a tour place almost directly across of the gang (street) that Dewa Homestay is off of, on Sosrowijayan Road. They gave a “deal” of 90,000 Rupiah each (three people) for our own private car to take us to the two temples, then back to our hotel. I still think it’s a bit steep, but that’s what the price was! Other tour companies were stating more, but there’s a bit of room for negotiation. Keep in mind this is just your private car to take you to and from the places. Also since we had this private car we weren’t constrained to a time or group of people. We went at our own pace and chose when to come and go. This is also best when trying to avoid the large tour groups. You can take local buses, but it apparently takes at least double the time to get there and back and we would likely not be able to fit in both the temples in one day, which we wanted to do. The fee to get in the temples was astronomical in my opinion. I have never paid so much for entry to a temple. 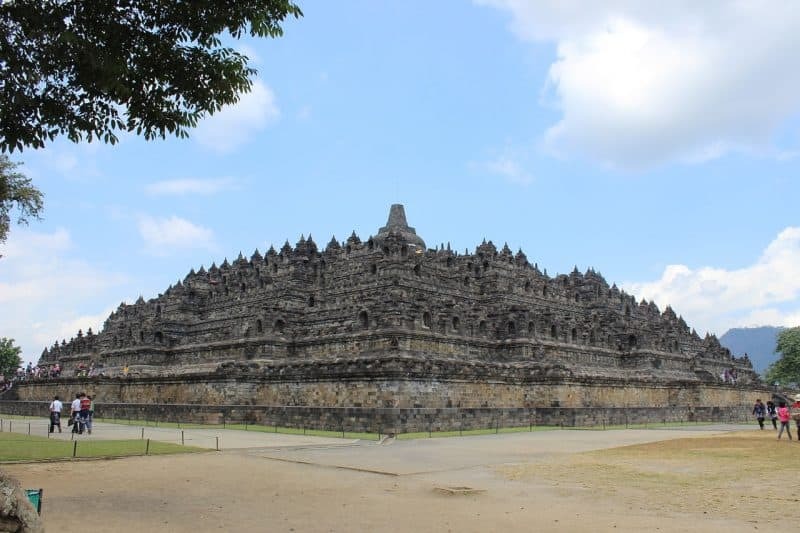 We paid a combo price of 360,000 Rupiah each, this got us into both Borobudur and Prambanan. If you go on the weekends, it’s even more, and if you are a student, you get a discount. You must present a valid student card to get the discount. In addition to that fee, getting the guide was extra, at both temples. It was an extra 100,000 Rupiah and you can have up to 6 people in your group, this is why it’s worth making friends at the front door to split this with. You get a free coffee/tea upon entrance of both temples. Make friends to make the car and the tour guide cheaper. Get your own car to avoid the large tours, time constraints, and get to fit in both temples in one day. Definitely get a tour guide to explain everything, it’s certainly worth it. 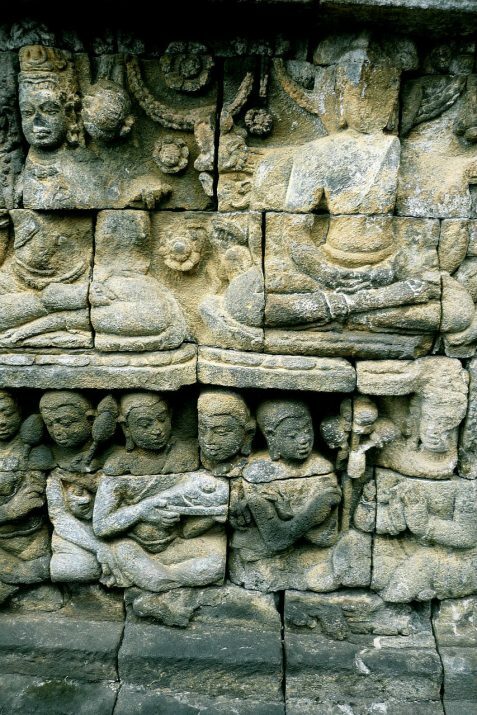 Borobudur Temple depicting the ancient culture of Indonesia. We set off together at 5 am, yes, FIVE AM, to get to Borobudur. It was about an hours drive from the city. We ended up meeting a few others at the temple entrance and decided to go in on a guide together. Obviously, this makes everything cheaper, and we are making friends! Having a guide proved to be a good choice. It’s going to make your time here much more worth it, interesting, and informative. Walking around aimlessly without having a clue of what you’re looking at isn’t as rewarding and might not make your experience as nice. So, the two girls and I teamed up three others, a Czech couple, and a Spanish guy. It was a humbling and amazing experience to be walking around this temple. It’s impressive for a lack of better words. You would just have to be there to know. I wish it was a bit of a clearer day because there’s apparently some nice views of a volcano or two in the background, but I also was a bit thankful for the overcast because it wasn’t blazing hot as usual. Our guide explained some of the intricate details that were etched in the buildings walls. These ancient stones tell so many stories of animals, sacrifices, love, and war. He explained the condition of the temple and the efforts to preserve it. There’s constant renovations in efforts to preserve the structure going on, and when they have finally made their rounds and “finished” the whole thing, it just starts all over again. When there’s an earthquake, it takes years to reestablish the way it was. Each block has a “lock” and is made to fit into each other. They are all unique, and therefore, finding the right piece for the puzzle takes a very long time. After Borobudur, we got back in the car for the hour an half drive to Prambanan. This is a Hindu temple, a complex, in fact, made of many temples. Like Borobudur, we decided we should get a guide. We met another couple and our new Spanish friend met us there to complete our group of six. Again we were wandering around an ancient complex that’s rather mind-blowing. The intricacies of the structures, the hard work, the massive monuments, the etching of stories and legends in the volcanic rock is simply magnificent! 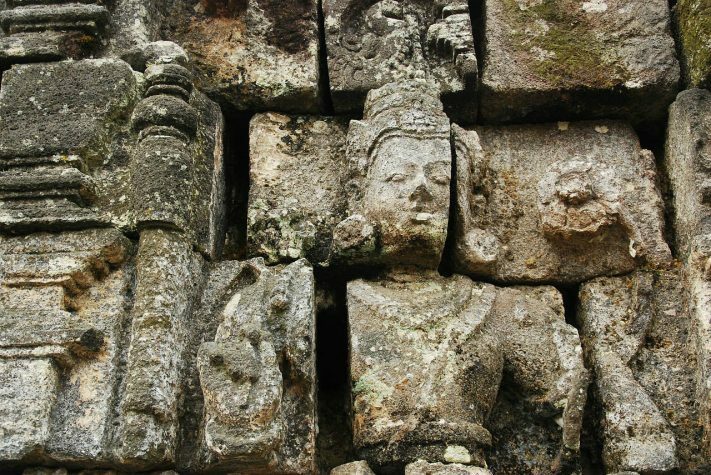 This spot has many small temples in the complex and each temple has another statue of a god or king or some other figure of importance. 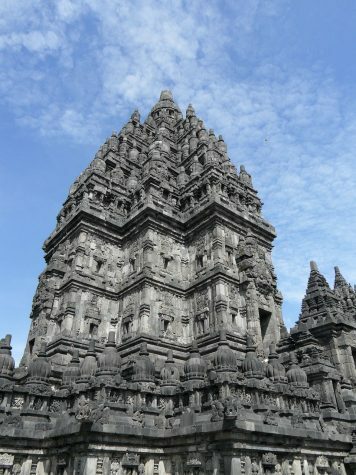 Prambanan is Indonesia’s largest Hindu site. Ganesha was in one of them, I love that guy! There’s a small trolley that makes its rounds and it’s free. Catch it for a quick ride out to more temples in the complex, walking is possible, but it would take a while and our driver was waiting for us. The temples in the back are a bit more dilapidated and there’re massive piles of rocks waiting to be put back together. 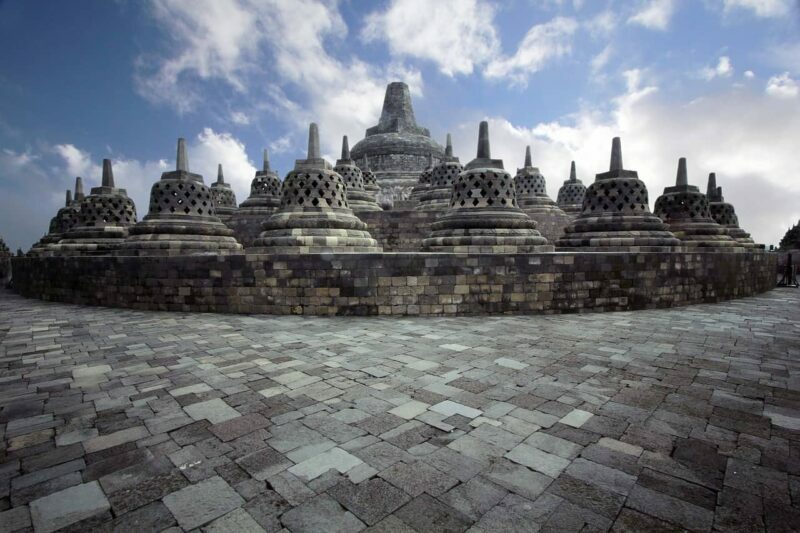 These two incredible UNESCO World Heritage Sites are a must see while visiting Yogyakarta! They will surely be some of the best temples you see in SE Asia, and I’ve seen my fair share! Trust me. After we were done, we met back up with our new friend, Juan. We had some sweets together and wandered the town a bit more since we were back by the early afternoon. We spent the rest of the day figuring out how to get to Pacitan, an off the beaten track beach we really wanted to go to…. We literally spent hours figuring it out. Luckily I wrote it all down so you don’t have to do the same. Check this out if you’re headed to Pacitan. 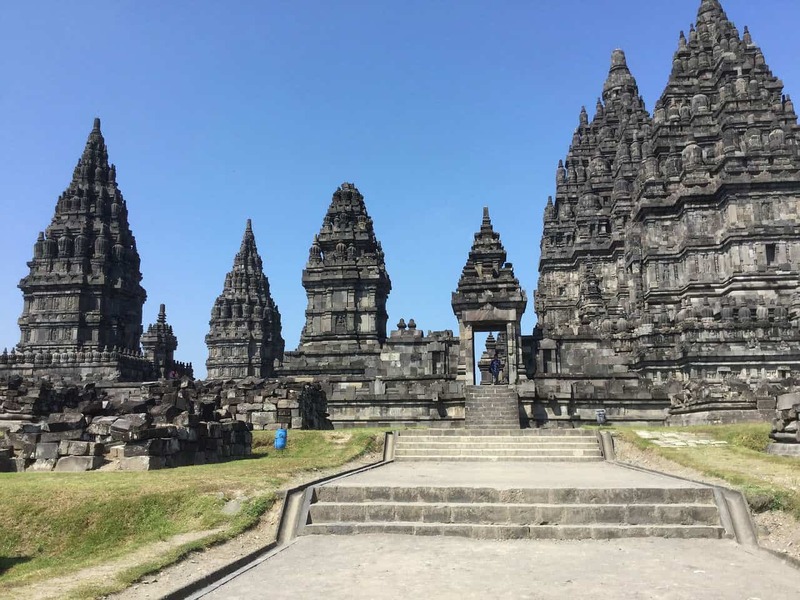 Check out more stunning things to do around Yogyakarta here and if you happen to be going to Bali after, check out this post from Backstreet Nomad for a unique way to see the island. Sharing is caring, Pin this!